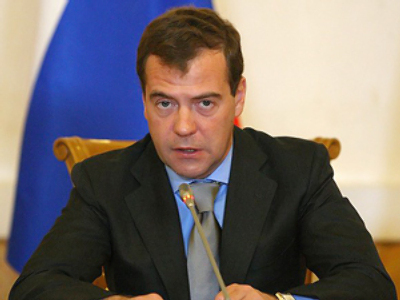 In an interview with Channel One TV, President Dmintry Medvedev said his family prefers to buy Russian food since they believe there are more chemicals in imported products than in locally produced food. Kirill Kleimenov, Channel One Current Affairs program anchor, was interviewing the Russian President at Barvikha, the presidential residence in the Moscow Region. Kirill Kleimenov: Good evening, Mr President. Thank you for finding the time to answer our questions. Our questions today are about agriculture – a very important subject, a big subject. Dmitry Medvedev: Good evening, Kirill. I think the time has come indeed to talk about the situation in agriculture. The time is right, and I think the place is not bad either. This is a good place to talk about agriculture’s prospects and problems. Q: There is a saying about spring in Russia that each day feeds a year. The same could be said of summer. This saying reflects the labor of literally millions of people. D.M. : A third of our country’s population. There is practically no other industrialized country in the world with such a big share of its population is engaged in agriculture. Q: As you see it, how is this sector, and the people working in it, doing at a time of – if not financial starvation – then at least strict rations? D.M. : Overall, we have prepared quite well to take our agriculture sector to a new level. Of course, we are still far from having carried out all of our plans. But implementation of the Agriculture National Project and a number of other programs in the sector means that, surprising though it may sound, agriculture has turned out better-prepared to meet the crisis than the industrial sector. The large-scale financial support the sector received, and the fact that we managed to carry out a number of organizational measures, have made this possible. So, I would not say that agriculture is living on strict rations at the moment. On the contrary, the State Agricultural Development Program, approved before the crisis began, is still being implemented. We have not changed it or cut back its funding, and it is being implemented in full. Total budget funding for agriculture is rising, not decreasing. This year it will come to 183 billion rubles. This is decent money. We are spending this money in a number of different areas. We are supporting key areas such as the livestock sector, crop growing and dairy production, and we are also spending some of the money on carrying out necessary transformations in a number of areas. The biggest problem right now is loans. In the industrial sector we have been forced to come up with new schemes and ideas, and they have not always all worked as we hoped, unfortunately. But in agriculture the mechanisms are already in place and have been tried and tested through the Agriculture National Project. What we are doing here is providing subsidized loans for the most important projects in the sector, in particular in the livestock and dairy production sectors. In other words, we subsidize the loans by paying the interest in full. We are also making progress on the big livestock sector projects that were already underway. This year, we will spend a considerable amount of money ensuring that the livestock and dairy projects that have begun will be funded through to their completion. We have carried out grain purchases. We are now one of the world leaders in terms of grain production, and this is a good result that has been achieved over these last few years. Russia was always a major grain producing country, and now we have restored our leading place in this market. We carried out intervention in the market at the start of the year and bought up around 10 million tons of grain. This also represented important support for the agriculture sector. It would be inaccurate to suggest, therefore, that financing for the sector’s development or support for rural areas has dried up. On the contrary, to go even further, unlike industrial production, agricultural production is growing rather than falling. This is a good result. Q: You mentioned the federal program. Am I right in understanding that this program arose out of the Agriculture National Project? D.M. : Yes, precisely. This is a state program to support rural areas. It is called the State Program for Agricultural Development and was enacted by a special law. It did indeed emerge from the Agriculture National Project. Q: Food security is a term we often hear these days. How do you understand this concept? It gets various interpretations at different levels, after all. D.M. : Security in all different areas is about protecting particular interests. Food security, therefore, is the means by which the state authorities ensure the conditions for guaranteeing that all people in our country will be provided with food at reasonable and affordable prices. That, to put it simply, is what food security is about. But there are different components involved in food security and different means of ensuring it. If we think back to the 1990s, say, you no doubt remember the large amount of, usually imported, cheap meat that filled our shops. Q: The famous ‘Bush’s legs’ [chicken thighs imported from the U.S.]. D.M. : Yes, the famous ‘Bush’s legs’ and a few other meat products. We are aware of the dangers involved in that kind of dependence on imports because, as soon as there is any fluctuation in the foreign exchange rate, if the dollar rises against the ruble, say, imports automatically become more expensive. This has not happened now, because we have replaced imported meat products with our domestic products. The same problem arises when epidemics, pandemics and epizootics break out. When these kinds of situations arise, imports come to a halt, and that puts the country in a potentially difficult state of affairs. There is a special food security concept that sets the capacity we should have to cover our own needs for a number of basic products. For example, we should be able to cover 95 percent of demand for potatoes, and around 80 percent for milk. In some areas, milk and meat in particular, we have not yet reached these targets. But it must be said that our imports of milk and meat have gone down since the crisis began, and this is creating opportunities for our own agriculture to develop. At the same time, it protects us against price fluctuations for these goods that are paid for in foreign currency, hard currency. This is a positive thing in terms of our food security. Last year, we imported around a third of all meat products, but the total figure for this year will probably be down to around a quarter. Q: Has demand not gone down at the same time? D.M. : Demand is somewhere around the same level it was before. There has not been any substantial change so far. Despite the crisis, this is nonetheless one of the most important consumption components. Q: In this context, I cannot but ask you about the situation that unfolded last week in our relations with Belarus. This was a serious case of dumping, when Belarus, our neighbor, was exporting its milk products here, milk powder, and Russia had to do something to protect and support its own producers. D.M. : Talking about these latest events, we were a bit taken aback, of course, by the way our Belarusian friends and partners reacted to what was happening. The situation is really quite simple, after all. What we need is civilized trade, even between such close and brotherly countries as Russia and Belarus. A year ago now, we adopted some new rules and said they would have to obtain new certificates for meat and dairy imports from Belarus. We know that they export a lot to Russia. Almost 100 percent of their exports in these products are to Russia. But a year went by and nothing was changed, nothing was done in Belarus. And so when the new rules took effect the trade flow came to a halt. That is the first reason for this situation. The second reason lies in the fact that our market is vast, but it is not unlimited. We have our own producers, and no matter what the warm and fraternal feelings we have for our Belarusian partners and for Belarusian farmers, our own farmers are still closer to our hearts. By now we have found solutions and trade will resume. I hope the situation we saw will not hinder the development of normal cooperation in the agriculture sector and also our coordinated action on accession to the WTO. After all, we established a special customs union together with Belarus and Kazakhstan, and now we will enter the WTO together. Q: Am I right in understanding that the tense situation has already calmed down now? D.M. : Yes, I think this is so. In any case, there is no reason to expect a flare-up in the situation. Q: Mr President, in the context of food security and imports, it is clear that one of the authorities’ main tasks in this area is to ensure a plentiful enough supply of food for everyone, and also ensure reserves, just in case. But people also want food to be high quality and come at a reasonable price. We have heard so often that imports are more expensive because they are better quality, but is this true in the case of agriculture products? D.M. : I do not know who said this. There is inevitably some exaggeration involved. It sounds more like the promotion spiel foodstuffs importers would make. There are all sorts of different products, but in the case of standards for our agriculture products, the standards are very high. In some cases, our products have preserved their high quality over the decades, withstanding global trends towards the standardization of agricultural products, foodstuffs. Of course, every country becomes used to its own products. Some people might say that imported products are higher quality, but most people here think that Russian-made products taste better. There is no arguing with this: after all, these are the products we have eaten all our lives and they really are our favorites; products prepared here in their own way. If you take ice cream, for example, foreign ice cream always seems rather tasteless to me. Though the ice cream being produced here now under foreign license has been adapted to our tastes and they are making it sweeter now, more concentrated, more intense in taste. D.M. : Creamier, yes, precisely. I think it is all a difficult thing to say which products are better and which are worse. What our producers definitely need to think about is how to reduce costs, how to modernize dairy and meat production, crop growing, and how to carry out good processing. Processing is lagging behind production. It is lagging behind meat and milk production and lagging behind the harvest. This is a crucial direction for work. We have been investing a lot of money in processing and will continue to do so, including by making state loans available to agribusiness enterprises. Packaging is another area that needs work. When you look around in the shops the foreign goods look better (this used to be the case, at any rate). Our packaging is looking quite decent now, because we now have companies producing good packaging for our various products. If we work on these areas everything will be fine. Q: When choosing what to put on the table, does your family pay attention to whether a product is locally produced or imported? D.M. : Yes, of course. In my family, as in probably any other Russian family, we are attentive about the products we buy and often think that there are more chemicals in imported products (this is a widespread view). Of course, it is very debatable as to whether this is actually the case or not, but this view exists nonetheless. And so, in my family, we prefer to buy Russian products. Q: Coming back to the situation in agriculture in general, a lot has been achieved over these last years. Large new agricultural enterprises have emerged, whole new villages have been built, and then, of course, there is also the program to connect rural areas to the gas supply, which is also very important. What is your assessment of the results so far, and – no less important for those who live and work in rural areas – what do the authorities plan to do in the future in this area? D.M. : I have said in the past that the National Project in Agriculture is different from the other complex state projects, in that it not only sets out to develop agricultural production, but is also a means of improving the lives of a huge number of our people, a third of our population, the tens of millions of people who live and work in the countryside. This is the way the Russian economy is structured and it will remain this way for a long time yet to come, even though in other countries the picture is somewhat different. Therefore, in implementing the Agriculture National Project, our goal is not just to invest billions of rubles in producing high-quality agricultural goods, and develop production, although this is certainly of primary importance in terms of rural development. Our goal is also to ensure that life in the countryside is decent and attractive, so that young people will not head for the cities because there are only old women left in the villages; no jobs, no housing, no decent medical care. This work is also part of the national project. I think that we have achieved some results. Of course, we have not radically transformed the situation, but we have made some progress. First of all, since we began implementing the Rural Social Development project in 2003, around 200,000 villagers have received apartments and houses through a budget-funded program. This is not a bad result. Of these, around 50,000 are young people, and this is especially important. This is as far as the state program is concerned, but there are also commercial programs through which collective farms and agricultural cooperatives buy housing for the villagers, and this adds another dimension. The gas supply program is a separate program and perhaps one of our biggest successes of late. In any event, for Gazprom this is a big undertaking and a part of its work with an important social dimension. Over the last 3.5 years, 7.6 million people living in rural areas have had their houses and apartments connected to the gas supply network. This is really an impressive figure. It comes to around a quarter of all homes in rural areas. Q: This represents a new quality of life for these people? D.M. : It is a new quality of life. I remember when I was working in the Government and also working at Gazprom as a member of the Board of Directors, and I visited villages and saw villagers with tears in their eyes saying how long they had waited for this moment and what a joy it was for them. We absolutely need to continue this program through to its completion, despite the crisis and the cutbacks to investment programs, including Gazprom’s programs. We will definitely complete this program. The goal is very simple – all of our villages and all of our towns should be connected to the gas supply networks. Q: What timeframe do you see for this project? D.M. : We think that it could be completed somewhere around 2015. Some areas are really very remote, especially in Siberia and the Far East, where there are villages hundreds of kilometers away from anywhere else, but we need to get the gas supply into these places too. In some cases, we will make do with electricity supply, but overall, the majority of our settlements will be connected to the gas network. Q: World oil prices are on the rise again. With the current price formation system we have in our country and the fact that internal tax revenue depends in part on world oil prices, does this mean that the cost of petrol and diesel could start rising here soon? And if this happens, when the time comes to start collecting the harvest, agricultural producers and the authorities will have a headache to deal with once again. What solution do you see? D.M. : We would face the prospect of yet another ‘battle for the harvest’ as it has always been called here. D.M. : I think the situation is better this year than last year, despite what is happening with oil prices right now. On one hand, it is in our interests to see oil prices rise, because the extra budget revenue it brings is crucial for the well-being of millions of people, including in rural areas. On the other hand, we do not want petrol, fuel and lubricant costs to go up. The Government has therefore decided, and briefed me on its decision, to freeze prices this year for fuel and lubricants, in particular for diesel fuel and low-octane petrol. We made this decision, and the sowing campaign took place with these fixed prices in effect. There was practically no change in price between March and May. Now we have the same task concerning the harvest. The prices will be frozen again. I think, therefore, that we will avoid the kind of problems you mentioned. I will not talk about next year’s situation for now, but as far as this year is concerned, prices for petrol fuel and lubricants and diesel fuel will be fixed at perfectly reasonable levels for the rural areas. Q: Coming back to the harvest, the problem is not only that crops need to be grown and then harvested. The harvested crops then need to be delivered to the market via the shortest possible route. But as far as the so-called farmers’ markets are concerned, what they really are is a system of middlemen that keeps their own grip on trade. D.M. : Yes, that is indeed the case, and these middlemen – sometimes perfectly legally, and sometimes in flagrant violation of the law – seriously inflate prices. Our task is not just to help establish agricultural cooperatives working on bringing in the harvest. Over the last years, we have set up 5,000 such cooperatives, and they have received considerable support – around 12.5 billion rubles I think. Our task is to ensure that these cooperatives, which bring together small producers, have access to the markets and can trade there. The weekend markets have proved a good idea; when the farmers themselves bring their produce to the market. This is something that is developing more actively now. Q: They trade straight from their vehicles, right? D.M. : Yes, and you can see the difference in price. So, the farmers are becoming more active in trade now. Given the choice between big markets and these weekend farmers’ markets, people choose the farmers’ markets because the produce is the same, but at a lower price. More investment is needed in market infrastructure. The criminal elements need to be cut out of the picture, and we need to take measures to encourage the farmers to either trade themselves, or get together to set up their own trading cooperatives. We have the farmers, we have cooperatives, we have big agribusiness enterprises, and we also have sales and supplies cooperatives, trading cooperatives, which are essential in the rural areas. Q: Mr President, people have been talking about agriculture of late more than ever, it seems. I wanted to ask you a few questions about international politics too. This week, the first full-format BRIC Group summit took place, bringing together Brazil, Russia, India and China. The BRIC countries between them cover half the world if you look on the map. Could we say that a new political and economic centre of influence has emerged? If so, what role do you think it will play? D.M. : I think this really was a historical and very significant event, because it marked the emergence of a new forum for resolving global problems. As you rightly said, Russia, Brazil, India and China are all very big countries. India and China are the world’s biggest countries in terms of population, and Russia and Brazil are the biggest in terms of territory, and we also have a sizeable population. These four countries unite practically half of the world’s population. Of course, the decisions these countries take are decisive for resolving many of the world’s problems, including coming up with a global response to the financial crisis. The fact that we were able to get together and hold this summit, discuss the global agenda, examine ways to work together to overcome the global financial crisis and talk about the future international financial system was really very important. During our discussions in Yekaterinburg, I pointed out to my colleagues that none of us took part in establishing the international financial system back in the 1930s-40s. I mean, none of our countries took part. Everything was decided for us. We cannot accept this situation again. We need to ensure that our countries, which between them are home to billions of people, take part in setting the new rules of the game. It would be unforgivable of us to let things develop otherwise. For this reason too, this new forum has great interest and relevance today. And, of course, it gives us the possibility of coordinating our policies on this or that issue. So, I am pleased that this summit has taken place and that we were able to discuss a wide range of issues, including matters of great global relevance today. Q: Will the BRIC summits take place on a regular basis? D.M. : We are in the process of deciding how we will plan our future meetings, but whatever the case we will get together as necessary. Q: Another big international issue that will soon become a talking point is the UN conference on climate change, which will take place in Copenhagen in December. We already know that most of the Western countries, including Russia’s G8 partners, have already set their medium-term greenhouse gas reduction targets. What line is Russia taking on this issue? When will Russia state its position? D.M. : Russia is behaving in worthy fashion in this situation as in other situations. For a start, despite a number of difficulties, Russia signed up to the Kyoto Protocol and its obligations, something that a number of big countries did not do. K.K. : We know which countries you mean. D.M. : Yes, they are well known. Second, Russia’s position is that we must follow responsible policies in the areas of efficient use of resources, energy efficiency and of emissions, that is, greenhouse gas emissions. One of my first executive orders upon taking office was an order to reduce our economy’s energy intensiveness by 40 percent by 2020. This is a large-scale and serious undertaking, which is very important for our country and for the world’s climate. We are reflecting now on the next steps to take. Everyone is talking about the Kyoto Protocol, about what will succeed it, about what needs to be done now. We do indeed need to set greenhouse gas emission reduction targets, because greenhouse gases are having a highly damaging impact on the global climate. Our position is that, based on the current situation, by 2020, we could reduce our emissions by around 10-15 percent. In this way, we would not deprive ourselves of development opportunities, while at the same time making our contribution to the international efforts to fight climate change. Overall, what this would mean is that over the total period from 1990 through to 2020, that is, over a thirty-year period, we would reduce our total emissions by 30 billion tons. This is a worthy position and a serious effort. Frankly speaking, we hope to see similar steps from our partners. I have said on a number of occasions that climate change is something we all need to work on together. It is an all or no one issue. If the approach is that it is nobody’s concern, then everyone can relax, but that would be a fatal road to follow. If we let this happen, we would end up not being able to sit like today, on the banks of a beautiful lake and hear the birds singing. Q: But Russia is not going to take unilateral steps in this area? D.M. : No, of course not. We will take coordinated steps together with our partners in the international dialogue on the subject.